Phycoerythrin conjugated Mouse anti Bovine TNF alpha antibody, clone CC327 (MCA2334) used for the evaluation of TNF-α expression by bovine PBMC following M. bovis infection. Identification of multifunctional IFN-γ, IL-2 and TNF-α CD4+ cells in natural M. bovis infection. 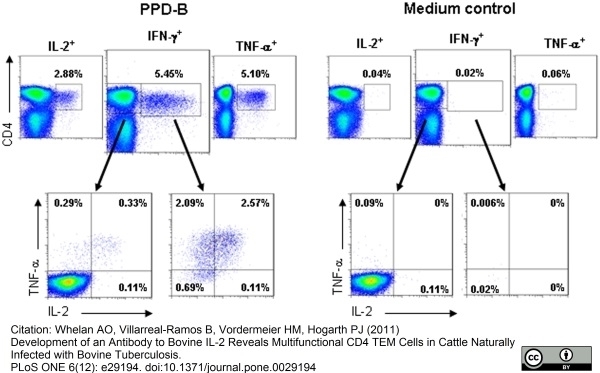 PBMC from naturally M. bovis infected cattle were cultured in the presence of either PPD-B or medium and the co-expression of IFN-γ, IL-2 and TNF-α determined by ICS flow cytometry. Histograms were gated on singlet, live lymphocytes and then all CD4+ cells analysed for all combinations of cytokine productivity. The upper histograms show the total proportion of CD4+ cells staining for expression of IFN-γ, IL-2 or TNF-α following stimulation with PPD-B (left panel) or medium control (right panel). Subgating of the IFN-γ+ and IFN-γ− CD4+ cells provides histograms that represent all possible functionalities for the expressing of the 3 cytokines, as shown in the lower histograms. The numbers indicate percentage of CD4+ cells and data are representative of 1 of 10 naturally infected cattle. From: Whelan AO, Villarreal-Ramos B, Vordermeier HM, Hogarth PJ (2011) Development of an Antibody to Bovine IL-2 Reveals Multifunctional CD4 TEM Cells in Cattle Naturally Infected with Bovine Tuberculosis. Mouse anti Bovine TNF alpha antibody, clone CC327 (MCA2334) used as a capture reagent for the evaluation of TNF production using a sandwich ELISA with biotinylated clone CC328 (MCA2335B) as a detection reagent. Somatic cell count (a) and concentrations of IL-1β (b), TNF-α (c) and IL-8 (d) in the milk in bovine experimental S. epidermidis (-⃝-) and S. simulans (-&9689;-) intramammary infection during the two-week study period (mean ± SEM, n = 8 + 8; TNF-α n = 8 + 7). Milk IL-8 (p = 0.04) and IL-1β (p = 0.03) concentrations were higher in response to infection with S. simulans than with S. epidermidis. The SCC is expressed as a natural logarithm of cells/mL. 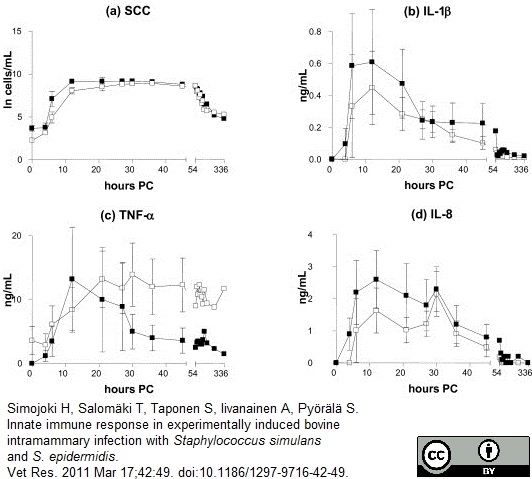 From: Simojoki H, Salomäki T, Taponen S, Iivanainen A, Pyörälä S. Innate immune response in experimentally induced bovine intramammary infection with Staphylococcus simulans and S. epidermidis. Vet Res. 2011 Mar 17;42:49. Mouse anti Bovine TNF alpha antibody, clone CC327 recognizes bovine TNF alpha, a 17.5 kDa cytokine, expressed by many different stimulated cell types including monocytes, macrophages, endothelial cells, fibroblasts and both T and B-lymphocytes. The production of TNF alpha is induced by a variety of factors, dependant upon cell type and includes bacterial toxins, IL-1, PDGF, IFN-beta, NGF, Oncostatin M and viral infections. The presence of TNF alpha is responsible for diverse immunomodulatory, anti-tumour and toxic effects and under certain conditions is also capable of self-stimulation and inhibition. This reagent may be used as a capture antibody in a sandwich ELISA for bovine TNF alpha in combination with MCA2335B as detection reagent. PBP005 may be used as a standard. Hope, J.C. et al. 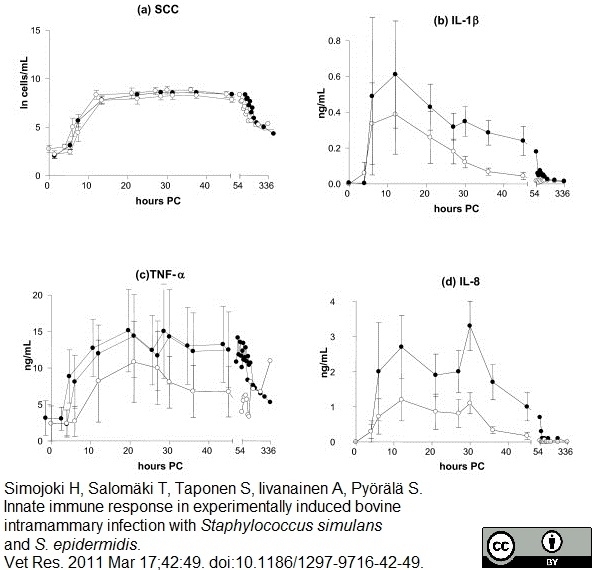 (2003) Maturation of bovine dendritic cells by lipopeptides. Vet Immunol Immunopathol. 95 (1-2): 21-31. Whelan, A.O. et al. (2003) Modulation of the bovine delayed-type hypersensitivity responses to defined mycobacterial antigens by a synthetic bacterial lipopeptide. Infect Immun. 71 (11): 6420-5. Guergnon J et al. (2003) A tumour necrosis factor alpha autocrine loop contributes to proliferation and nuclear factor-kappaβ activation of Theileria parva-transformed B cells. Cell Microbiol. 5 (10): 709-16. Kwong, L.S. et al. (2010) Production and characterization of two monoclonal antibodies to bovine tumournecrosis factor alpha (TNF-alpha) and their cross-reactivity with ovine TNF-alpha. Vet Immunol Immunopathol. 135: 320-4. Sow, F.B. et al. (2011) Respiratory syncytial virus is associated with an inflammatory response in lungs and architectural remodeling of lung-draining lymph nodes of newborn lambs. Am J Physiol Lung Cell Mol Physiol. 300 (1): L12-24. Science of The Total Environment. 542: 653-64. Maggioli, M.F. et al. (2016) Increased TNF-α/IFN-γ/IL-2 and Decreased TNF-α/IFN-γ Production by Central Memory T Cells Are Associated with Protective Responses against Bovine Tuberculosis Following BCG Vaccination. Rutigliano, H.M. et al. (2016) Trophoblast Major Histocompatibility Complex Class I Expression Is Associated with Immune-Mediated Rejection of Bovine Fetuses Produced by Cloning. Biol Reprod. 95 (2): 39. Camejo, M.I. et al. (2014) TNF-alpha in bulls experimentally infected with Trypanosoma vivax: a pilot study. Vet Immunol Immunopathol. 162 (3-4): 192-7. Jolly A et al. (2016) Evidence of a pro-apoptotic effect of specific antibodies in a bovine macrophage model of infection with Mycobacterium avium subsp. paratuberculosis. Vet Immunol Immunopathol. 169: 47-53.